Jim Smiley was a betting man. He bet on horse races, dog-fights, cat-fights, even how long it took a straddle-bug to cross the border into Mexico. If there was a bet to be made, chances were the "uncommonly lucky" Smiley was behind it. 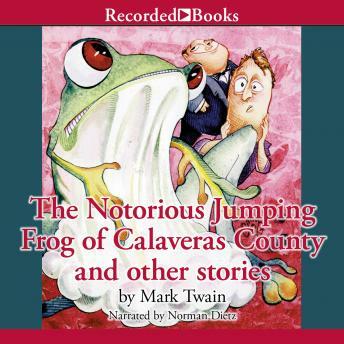 So it seemed life easy money when a gullible stranger came to town and Smiley boasted to him that his pet frog-Dan'l Webster-could "outjump any frog in Calaveras County." But while Smiley was out scouting for the competition, the stranger came up with a plan to stop Dan'l-and Smiley-in their tracks. The publication of "The Notorious Jumping Frog of Calaveras County" in the Saturday Press in 1865, marked the beginnings of Mark Twain's remarkable literary career. This collection of eight stories upholds his title as America's greatest humorist and storyteller. Includes these stories; "A True Story"; "Jim Baker's Blue-jay Yarn"; "The Private History of a Campaign that Failed"; "Extracts from Adam's Diary"; "Eve's Diary"; "The 1,000,000 Bank-Note"; and "How to Tell a Story."